Superior Pump 91250 is a fully submersible thermoplastic utility sump pump that can be used for all your drainage and water transport needs. It is designed to remove any stagnant pools of water even at very low levels, which is ideal for the rainy season where basements are flooded, or when various puddles of water form around the farm or yard. Superior Pump 91250 is a light-duty utility pump suitable for common household requirements for lifting excess water from pools. It also works excellently as a sump pump upon some nominal modifications. This pump is suitable for removing water spills from basements and is effective at helping you during handling emergencies. Compact design and low consumption makes this pump highly user-friendly and application oriented. It is portable and fits in a bucket in case you want to carry it with you. Superior Pump offers this pump with one-year limited warranty at an alluring price band of around $50 making it very reliable standby option. 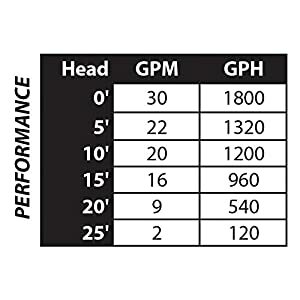 Pick Superior Pump 91250 in case you are looking for a maintenance-free and reliable pumping option. The pump is submersible and has suction in the bottom. This means that the pump runs superbly even in water levels as low as 1". It consumes very less electricity with its 115VAC/3.8A rating. 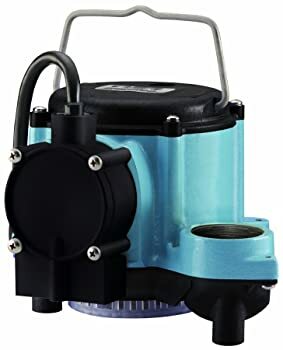 Buying this pump definitely is an affordable option over to renting a pump to drain the pool. It is UL/CUL listed and is CSA certified. It ships with 10' cord ideal to serve all applications. The pump is easy to install and operate. Installing and connecting a float switch turns this pump into a sump pump. Superior Pump has offered a power-packed product at the highest affordability of operations. The pump is rated at 115VAC/3.8A. It weighs 8 lbs and it is compact in size featuring 9.3" x 5.4" x 5.9". In addition, it has bottom suction and top 1-1/4" MPT outlet. Superior Pump supplies it with 3/4" garden hose connector. The pump is capable of lifting water at 25' head. It is designed for 1/8" sized solid handling. The pump has built-in thermal overload protection. It has thermoplastic jacket for superior look and easier handling. It has 1/4 HP capacity, powerful split capacitor, and it delivers up to 30 gallons per minute. It is substantially portable at a weight of 7.2 lbs. Superior Pump 91250 is suitable for all lightweight applications. 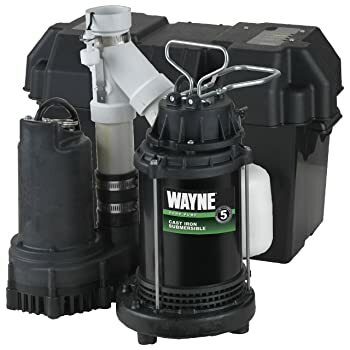 The product produces a low and steady hum during use with a low sump wherein the outflow hose was elevated at 3 feet from the bottom of the basement. It is equipped with standard GFCI-protected outlet for easy connectivity and compliance with building codes. It is a submersible pump and convertible into a sump pump. 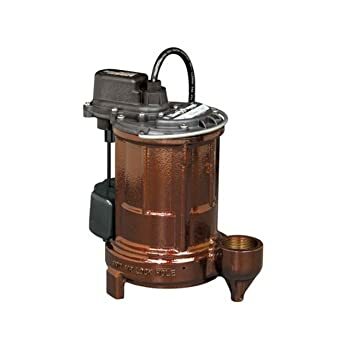 Comes with a built-in removable plastic filter fixed with screws, which helps prevent damaging the motor from debris and impurities larger than 1/6 inch. The pump installs and starts quickly. It does not require maintenance apart from cleaning the filter at the bottom in case the debris and dirt accumulates in it. Able to work with even 1/8 inch low water level. Suitable only for lightweight applications like draining pools, bathtubs, and waterlogged basements. It has a sturdy cord; however, it may lose its flexibility when exposed to low temperature. The pump has 1-1/4" MPT outlet. Therefore, a female adapter is necessary while connecting 1-1/4" garden hose. You may experience some sprays after connecting the supplied 3/4" garden hose connector without Teflon tape. The pump does not come with an automatic float switch. Superior pump 91250 has Thermally Protected, Capacitor Start, and Continuous Duty 1/4 HP motor. This motor is capable of delivering 16 gallons every minute at 15' head. Solids of less than 1/8" size pass through the pump easily. Larger particles are filtered at the bottom. It is equipped with built-in anti-airlock device. It is suitable to handle liquids at 32° F to 120° F. Installing a float switch with the pump makes is suitable to work as a sump pump. However, float switch do not ship with the pump. It starts as soon as it is plugged in. The pump is compact enough to serve in tough to reach places like cramped basements, roofs, etc. If possible, similar or larger sized pipes than the pump discharge pipe should be used for better performance. Never use the main power cord or even the discharge hose to carry the pump. This can cause tears and damage to the power cord or discharge hose. Never let the sump pump run dry as it depends on fluids for cooling and lubrication. Don’t use a cord that is longer than 25-ft., or one that is lighter than 14/3 gauge. What is the size of the pump? The pump is 9.3" x 5.4" x 5.9" in size and weighs 8 lbs. What is the maximum permissible height for water delivery? Superior Pump 91250 is designed to deliver water at 25' head. What is the liquid temperature range or limit that this sump pump can handle? The model 91250 can transport fluids from 32° F up to 120° F (0° C - 49° C). Temperatures exceeding this can damage the pump system. Can this be used as a sump pump for dirty water? Yes. 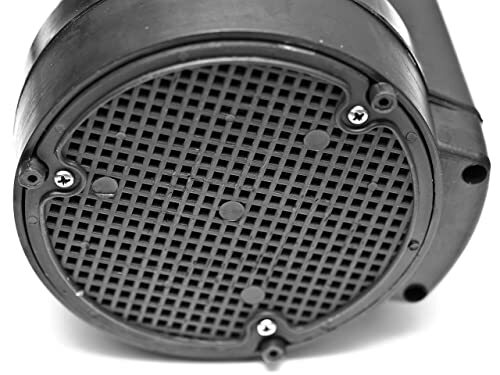 The product has a built in filter to help protect the motor from damage from large debris. It effectively pumps out water mixed with small debris without problem. How long is the warranty provided for the product? 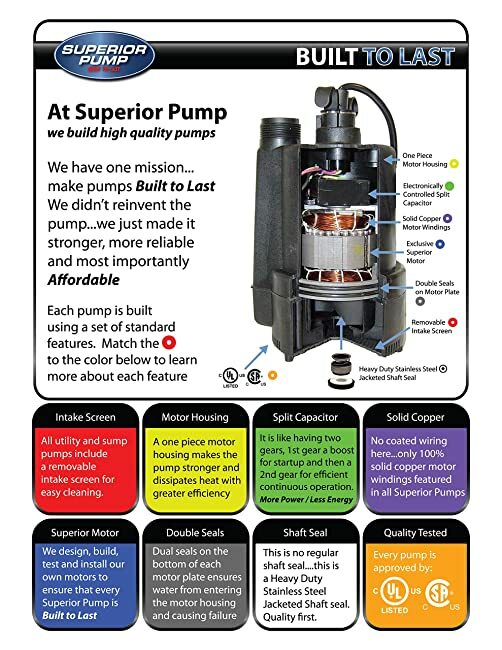 Superior Pump gives its consumers up to a year from date of purchase to fix or replace any defects or damages to the product. Although light-duty Superior Pump 91250 delivers as it promises. With the price tag of around $50, it is a perfect standby option. The pump is suitable for running for extended periods at minimal costs of operations. 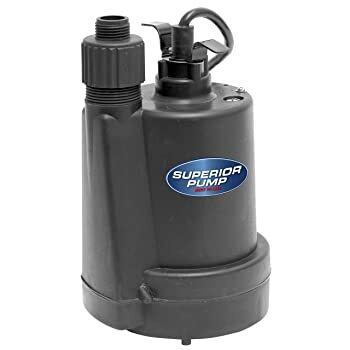 It indeed is a superb replacement option in case you rent pump to drain your pool. Buying such a handy pump keeps you ready for emergencies. The pump furthermore comes with thermal protection circuit, water-cooled design, anti-airlock device, 10' tough cord, bottom suction, and suitability to various types of hoses and 32°F to 120°F liquid temperature range. It can only be compared with Liberty Pumps 257, the super-performer submersible pump from its class. Select this product if you are looking for a light-duty yet reliable pump as a standby option at the best price band the industry ever has to offer.